About the Author: Brittany Cavallaro is a poet, fiction writer, and old school Sherlockian. 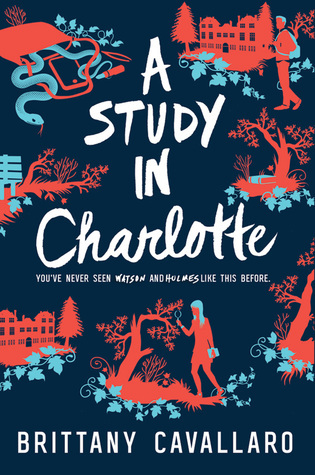 She is the New York Times bestselling author of the Charlotte Holmes novels from HarperCollins/Katherine Tegen Books, including A STUDY IN CHARLOTTE, THE LAST OF AUGUST, and THE CASE FOR JAMIE (forthcoming in March 2018). She's also the author of the poetry collection GIRL-KING (University of Akron) and is the recipient of a National Endowment for the Arts fellowship. She earned her BA in literature from Middlebury College and her MFA in poetry from the University of Wisconsin-Madison. She lives in Michigan with her husband, cat, dog, and collection of deerstalker caps. My Review: I remember wanting this book all because of the cover that I looooove! I’m a huge Sherlock fan so I was dying to get my hands on it. It was tons of fun to read! The writing was excellent, the story was incredible, the mystery was satisfying, and the twists were great!! Charlotte and Jamie were so freaking cute too! They complemented each other so freaking well. I'm dying to read more about them. I just can't get enough of them. I'm sososo very interested to see what happens next. Time to grab book 2!! Do I Recommend this book? Heck yeah!